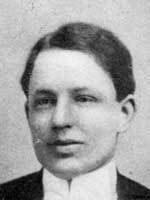 Born at Foresters Falls, Ontario in August 1882, son of E. M. and Anne Moxam, he was educated at the public schools of Foresters Falls. He came to Winnipeg in 1902 and engaged in the real estate business, building Moxam Court and several other large apartment blocks. He moved to Vancouver, BC in 1926. In 1907, he married Blanche I. Boyle of Cobden, Ontario. He was a member of the Carleton Club, Adanac Club, Canadian Club of Winnipeg, AF & AM, Conservative party, and Methodist church. His recreations included motoring and bowling. In 1911, he lived at 250 Wellington Crescent, Winnipeg. He died at Victoria, British Columbia on 11 December 1941. “John A. Moxam”, Winnipeg Free Press, 12 December 1941, page 8.